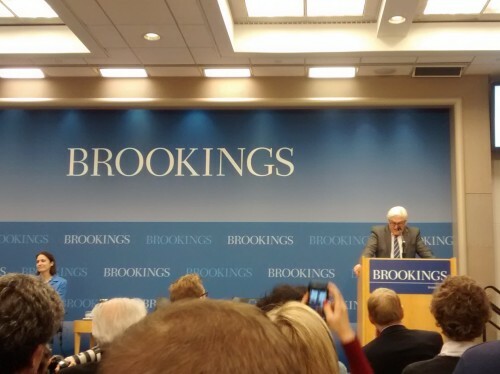 This morning, I went to see German foreign minister Steinmeier’s speech at the Brookings Institution. Under the heading “Transatlantic Ties for a New Generation”, he argued that to be attractive for young people, the European-American partnership has to be based on shared values and standards of governance. The text is on the ministry’s website. In addition, Brookings published the audio and video recordings of the speech and the Q&A. To be fair, this speech was more interesting and better prepared than the last foreign policy speech delivered by a Social Democrat that I have attended. Still, if you go beyond the personal anecdotes and jokes he made, Steinmeier said very little, let alone . The Q&A, regrettably, was hurt by the fact that Steinmeier – who had given the speech in English- answered in German. So a lot of time was spent on translation and we only covered four or five (pretty harmless) questions in total. On Europe: Between Germany and the UK, fundamental disagreements remain about the general trajectory of EU integration. We might see more subsidiarity in select issue areas, but no reversal of integration. (Those ***** Brits! As if we didn’t have enough problems already. Oh, and maybe we should tweak those austerity policies in Southern countries, but please don’t ask about specifics). So, as you can see, no grand commitments or surprise announcements were made today. German foreign policy remains, ahem, underwhelming.